This is excellent! The best short and concise support and defense of the Bible I’ve ever heard in one presentation. Well worth your time! The best video on proving the Bible is the Word of God! The Evidence for the Bible DVD serves as a good, solid resource to reinforce the reliability of the Bible. We just finished watching Evidence For The Bible part 1 for the third time this last year and a half. I am a homeschooling mom of 6 kids and I have been reading the corresponding articles and watching the DVD with my 10 and 12 year old daughters. All three of us love them so much! My ten (now 11) year old says that she loves it because it is so easy to understand and each evidence has a lot of information in little segments. As the mom, I love it because it’s so organized and includes so much information. It’s also really nice and short. Originally we were doing it at Bible Time all together. The next few times we went through it, I assigned one evidence per week to review. We also love it because it’s a fun break from all the other regular reading assignments. It’s just fun to watch!...We can’t wait to do part two and then buy more of your DVD’s. A question was raised In our men bible study about the accuracy of the bible; after debating, and presenting our evidence, we showed the DVD, and let the teaching on It, speak for Itself. It's a great tool for discipleship, because the evidence can't be refuted. Love it. All anyone needs to prove the TRUTH. This DVD is a great tool for both defending the faith and responding to those who challenge the truth. 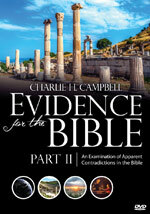 Thank you Mr. Campbell for a riveting review of the evidence for the Bible! Awesome! I've been going to church for 74 years, since I was a child, and I've never heard any of these evidences for the Bible laid out like this. It is just awesome! Everyone needs to see this. Thank you Charlie! Amazing watch, highly recommended for those tough questions!